It was later revealed that the Brewers were trying to dump Nyjer Morgan back on the Nationals after getting sick of him. They hoped that if the Nationals won, they wouldn't think anything of a drugged Morgan dumped in the clubhouse, wearing a ratty red t-shirt, and figure he was still on the team. Fortunately they were unsuccessful and even more fortunately, the Nationals won. As I mentioned yesterday, several Nationals players are slumping to the point of embarrassment. I have slowly come to the realization that this is not due to the cool weather, or the tough matchups, or even the moon's powerful pull on the earth. Rather, it has come to my attention that the Nationals really just miss The Shark. Ian Desmond for example, who was arguably hit the hardest by the departure of the Shark, is currently batting 0 for 25 at home and batting this season. That is definitely not the kind of production you want to see from your leadoff hitter. Danny Espinosa led off tonight and went 0 for 4... Not great either. 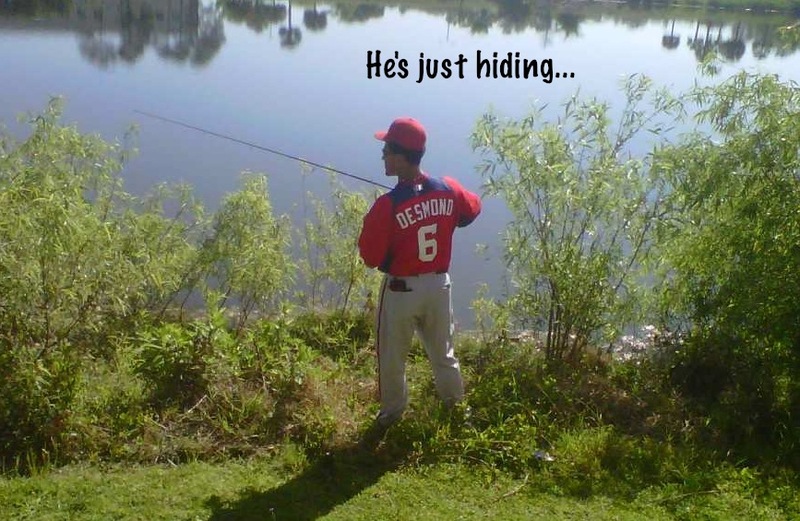 In an interview, Desmond stated, "It's just really hard for me to be at home (Nationals Park...presumably?) knowing that the Shark isn't there with me. When we're away, I can keep it out of my mind, but home, without Roger, it's just...I'm sorry (eyes begin watering, )... so hard...I just can't deal with this right now. I need to go find him. Excuse me." Desmond then grabbed his nearby fishing pole and left the room. Michael Morse, who was batting .133 going into play today is also having a hard time dealing with the absence of the Shark. "We just can't be the Shark Tank without him. People call me Mike... What the Sh**k's happened to Mako?! I'm a Shark (note: not The Shark), damnit. Jayson [Werth] and I talk about it all the time. He wants to be The Great Werth again! He's too good to be batting .217. We need The Shark back now!" Morse then tried to start a "We-want-the-shark-to-be-promoted-from-the-minors-so-that-we-can-win-the-games-that-the-Nationals-are-playing-against-the-other-teams-in-the-major-leagues-cause-the-shark-can-help-us-really-do-just-that-Win-I-mean." chant going with the interviewer. It didn't catch on. RicK AnKiel, batting an even .200, seems to be ready for the Shark to be back as well. Ankiel was recently overheard talking to Rizzo and Riggleman(R&R) stating, "Alright guys, the joke is over. It was fun while it lasted. I think the fans really got a kick out me starting in center (dunno where he got this info from? ), but I'm officially ready. Promote The Shark so we can win." There has been no official word from R&R on the discussion. Roger Bernadina started his second game in Syracuse tonight, going 1 for 4 with a single. Not as sharkadelic as yesterday, but he's still batting .375, which is better than AnKiel's and Morse's batting average combined. Promote The Shark, please!